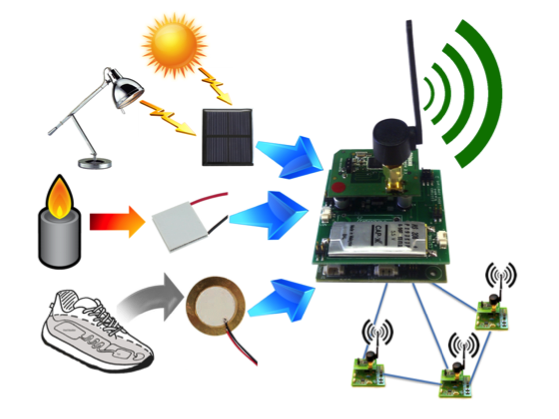 Wireless Sensor Networks (WSNs) have garnered significant attention in recent years. They consist in a set of spatially distributed autonomous devices, usually battery-powered and designed to operate for a long period of time. Consequently, minimizing the energy consumption is a very important design consideration and very energy-efficient wireless transmission schemes together with ultra low- power platforms and very light software must be combined for data processing and transfer over the WSN. The radio in both transmit and receive modes consumes the bulk of the total power consumption of WSN systems. Therefore, protocol optimization is one of the main sources of significant energy reduction to be able to achieve self-powered autonomous systems. Reducing power due to radio communications can be achieved by two complementary main objectives: (i) minimizing the output transmit power while maintaining sufficient wireless link quality and (ii) minimizing useless wake-up and channel hearing while still being reactive. As the physical layer affects all higher layers in the protocol stack, it plays an important role in the energy-constrained design of WSNs. The question to answer can be summarized as: how much signal processing can be added to decrease the transmission energy (i.e. the output power level at the antenna) such that the global energy consumption be decreased? The temporal and spatial diversity of relay and multiple antenna techniques are very attractive due to their simplicity and their performance for wireless transmission over fading channels. Cooperative MIMO (multiple-input and multiple-output) techniques have been studied a lot and have shown their efficiency in terms of energy consumption. Our research aims at finding new energy-efficient cooperative protocols associating distributed MIMO with opportunistic and/or multiple relays and considering wireless channel impairments such as transmitters desynchronisation. Another way to reduce the energy consumption consists in decreasing the radio activity, controlled by the medium access (MAC) layer protocols. In this regard, low duty-cycle protocols, such as preamble- sampling MAC protocols, are very efficient because they improve the lifetime of the network by reducing the unnecessary energy waste. As the network parameters (data rate, topology, etc.) can vary, we propose new adaptive MAC protocols to avoid overhearing and idle listening. Energy modeling is an important issue for designing and dimensioning low power WSNs. To help developers to optimize the energy burned by WSN nodes, a pragmatic and precise hybrid energy model has been proposed. This model is a combination of analytical derivations and real time measurements and considers different scenarios that occur during the communication. It is particularly useful to understand the MAC layer mechanisms, such as wake up or data collisions for the preamble sampling category, and the energy wasted by collisions can be evaluated. An adaptive wake-up-interval scheme for preamble sampling MAC protocols for variable traffic in WSN is then proposed. The wake-up-interval is updated based on the traffic status register (whose contents depend on the presence of messages for a particular node). The results show that the sensor node adapts and converges its wake-up-interval to the best trade-off value for fixed and variable traffic patterns. A wireless body area sensor network (WBASN) exhibits wide range of traffic variations based on different physiological data emanating from monitored patients. In this context, we proposed a novel energy efficient traffic-aware dynamic (TAD) MAC protocol for WBASN. A comparison with other energy efficient protocols for three different widely used radio chips i.e. cc2420, cc1000 and amis52100 was performed, showing that TAD-MAC outperforms all the other protocols under fixed and variable traffic rates. We have proposed and developed PowWow (Power Optimized Hardware and Software FrameWork for Wireless Motes), a hardware and software platform designed to handle sensor networks and related applications. The main innovating features of the platform are: an energy-efficient MAC protocol (15x less power than the ZigBee standard was reported for equivalent applications), a much more light memory usage, a low-power FPGA for acceleration of part of the software stack (energy reduction of two orders of magnitude was reported for error control and correction) and, more recently, a board including small-scale energy harvesting features. Our work take benefit from PowWow to perform power measurements that can be directly introduced in energy consumption models, leading to very precise predictions for the class of preamble sampling MAC protocols. We strongly rely on this platform for the prototyping of future research in this domain.